It was two years ago this month that Bulbstorm was acquired, finally freeing me to set up shop as an independent marketing consultant. I tried to escape the 9-to-5 world twice before. Both of those attempts blew up on the launch pad. I tried to start my own ASU sports magazine, but was runner-up for the booster club’s contract. Then I was set to become a freelance copywriter when Bulbstorm made me an offer I couldn’t refuse on my way out of Insight. Two years into attempt my third attempt, this one seems to have reached orbit. I celebrated the anniversary as I celebrate most things – by traveling. Hey, after helping to organize the inaugural Phoenix Startup Week, I’d earned a vacation. So, I spent a week exploring the natural wonders of southeastern Utah. Enjoying my flexibility at Arches National Park. Flexibility! Get it?! I define solopreneur as anyone who runs his own business without intending to hire employees. There’s a lot to like about being a solopreneur. The most obvious benefit is that you’re the boss. You make the rules. An overlooked benefit is just that. Benefits. 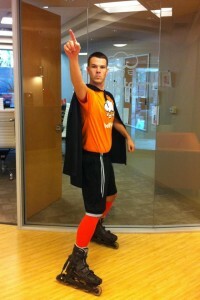 Corporate perks are one size fits all. A Friday afternoon beer cart. A discounted gym membership. Bagels and benefits. There’ll be some variability in health plans, but if you don’t have a pet then that pet insurance subsidy is useless. As a solopreneur, you choose your own adventure. Maybe you want to work from home instead of an office. Maybe you prefer to work only with companies with a conscious mission. I truly believe that a solopreneur should get more out of it than just not having a boss. It’s too hard and too risky otherwise. For me, being a solopreneur has been all about summers off and the ability to work for anyone I choose and from anywhere that has Wi-Fi. Did you know that there’s Wi-Fi in Yosemite National Park? Sure, I pay 100 percent of my health insurance costs. But, yeah, benefits rule. How long could it last? I’m loving my new career. I’ve learned about PR for tech startups and sharpened my sales skills working with Ubiquity PR. I’ve implemented CRM and marketing automation solutions for a number of companies, from software startups to a car dealership. I’ve built a digital marketing program from scratch for a custom tile manufacturer. And, yet, I wonder if and when my career as a solopreneur will end at the hands of opportunity. Two years after exiting Bulbstorm, I’m starting to get the itch to do another startup. Six years ago, Bulbstorm found me by googling Phoenix Marketing Copywriter and landing on this website. When I initially turned them down to focus on my new copywriting business, the CEO trash talked me on Twitter. I couldn’t turn him down after that. Is the end imminent? I doubt it. But, as I learned in my experience with Bulbstorm, you’re always one unexpected email from getting back in the game. View article on bizjournals.com here. Matt Simpson, the former marketing director with social media software startup Bulbstorm, left this week for a six-month, meandering trip with no set itinerary and no firm end date. Simpson, 34, of Tempe, will be blogging his adventures at www.mattmeanders.com. I’m driving north up the Pacific Coast to Seattle and returning south through the Rocky Mountains. I should be back sometime around October. From October to April, there’s nowhere I’d rather be than my home state of Arizona. 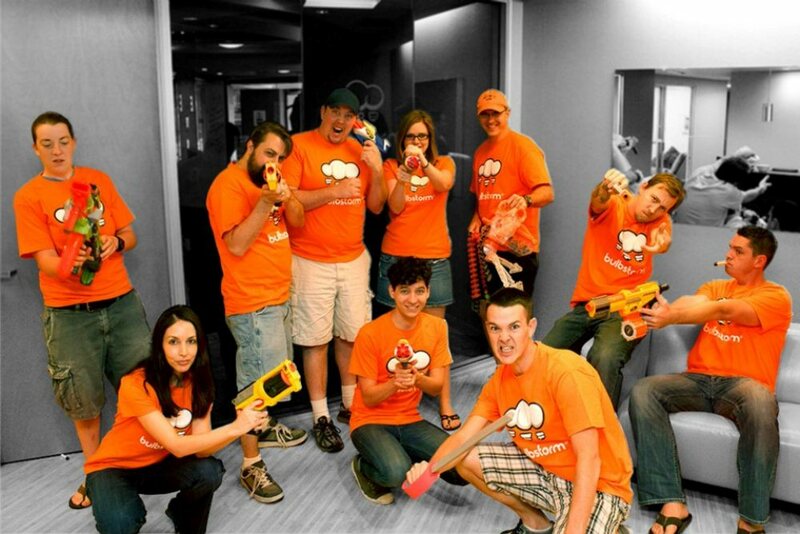 I was Marketing Director with Bulbstorm as we grew from six employees to more than two dozen en route to acquisition. It was quite a ride! When Bulbstorm was acquired by Detroit’s ePrize in March, I finally had the free time and excess funds to take a break and do something crazy. Six months on the road seemed a great opportunity to see the country and recharge my batteries before resuming my career. What are your plans for the trip? Nothing is set in stone, but I plan to hit as many cultural attractions and natural wonders as possible. One day I may be in an art museum in San Francisco. The next I may be camping at Yosemite National Park. From a business perspective, I’m hoping to explore the West Coast’s other prominent startup communities and bring what I learn back home. My only firm plan right now is to not plan. That said, I’m mindful of the fact that I’ll eventually be eager for a new challenge. To that end, I’ve been engaging with the Phoenix startup community to ensure I’m kept abreast of opportunities. And I’ve been keeping my tools sharp by contracting with Ubiquity PR, a Phoenix firm that works with high-growth B2B technology companies across the West. How will technology play a part in your trip? In addition to camping and staying with family and friends, I plan to book accommodations through Airbnb and Couchsurfing. I’ve hosted travelers through both services and really enjoyed the experience. If you know of a couch I can crash, please let me know! Also, I’m a communicator at heart, so I’m always eager to share my adventures with others. I’ve built a travel blog on WordPress and I’ll be keeping friends and colleagues up to date through Twitter and Facebook posts and an email newsletter. The challenge for me will be unplugging. Fortunately, Yosemite and Yellowstone don’t have wi-fi … yet! The 28th class of Tempe Leadership graduates today. I don’t think it’s a stretch to say it’s the best class ever, but I may be biased as a member of Class XXVIII. 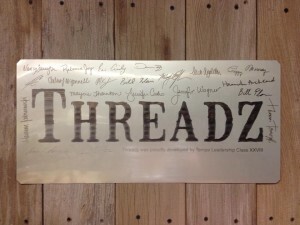 The Threadz 4 Success plaque bears the signatures of my 20 awesome classmates. Touring the water shed … on a helicopter! If you have an inquisitive mind, Tempe Leadership is one unique experience after another. In the second half of the program, I toured Tempe’s historic neighborhoods, explored traditional and holistic healthcare at St. Luke’s Hospital and Southwest College of Naturopathic Medicine, and shadowed Cold Stone Creamery SVP of Marketing Kate Unger during a commercial shoot. But the highlight was a tour of the Valley’s water shed … aboard SRP’s helicopter! On a two-hour flight, we followed the Verde River north to Bartlett and Horseshoe lakes then returned south along the Salt River to pass over Roosevelt, Apache, Canyon, and Saguaro lakes. Quite a different vantage point from fishing and playing in the lakes as a kid. It’s not easy for me to not be central to things. It’s part of being an Enneagram 8. It’s not that I want to be the star. I just want to be relied upon. Building a marketing plan, running a meeting, and organizing the big picture all play to my strengths. Other things definitely do not. I had plenty of opportunities to not be central during the final stages of our class project Threadz 4 Success, a retail store for Tempe teens in need of clothing, school supplies, or personal care products. I know nothing about designing a retail store. But I can pick up a paintbrush or haul trash bags full of used clothes from a community drive. Watching 20 strangers form a team and make a difference. And it was epic! Threadz has already hosted two dozen JAG (Jobs for Arizona Graduates) students who needed clothing for job interviews. Some of these kids live in shelters or bounce from one relative’s couch to another. All found something they could wear in their interviews. And, in the coming years, many more will find the clothing they need to survive high school and contribute to our community. Are you interested in joining Tempe Leadership next year? I’m happy to chat about my experience far over coffee. Email me! 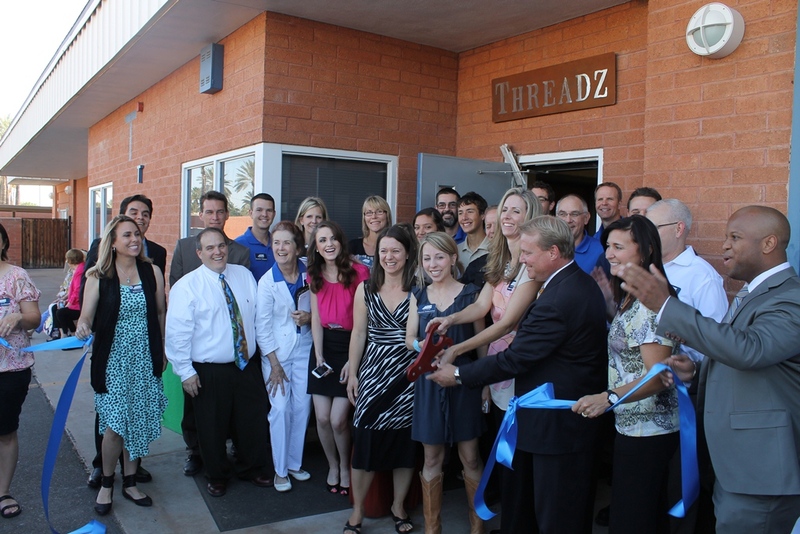 Tempe mayor Mark Mitchell cuts the ribbon at Threadz 4 Success. 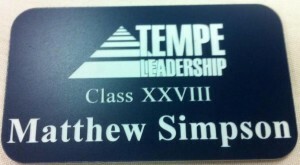 The holidays marked the halfway point of my nine-month Tempe Leadership program. It’s been an amazing experience! Unfamiliar with Tempe Leadership? Every year, 20 Tempeans are selected to develop their leadership skills, explore the inner workings of the city, and complete a community service project. As you’ll see in the list below, the experience is quite varied. 1. Watching the team form and perform. A key component of the program is the class project. Twenty strangers must identify a community need, pitch the board, raise funds ($10,000 in our case), and do the actual work … all in nine months. That means forming, storming, norming, and performing fast. Every class approaches this challenge differently. We split into four teams (renovations, fundraising, partnerships, and marketing), each of which defines and executes its own deliverables. Teams coordinate with one another through an executive committee. By dividing in this way, we each contribute from an area of strength while minimizing the size of meetings and email threads. Learn about our class project Threads 4 Success. 2. Learning how other leaders lead. Although I’m on the marketing team, I get to attend other teams’ meetings. It’s a great learning experience in two ways. First, as a fly on the wall, I quietly observe others’ personal styles for contributing, interacting, and leading. Those styles are as varied as our occupations, which range from entrepreneurs to engineers to police lieutenants. Second, I’ve been exposed to new skills. For example, our fundraiser (a holiday gift auction) was a huge undertaking. We raised over $7,000 in one night! I know little to nothing about putting on an event, so it was great to watch the fundraising team lock down all the details. Oh, and don’t get me started on observing and interacting with civic leaders like city manager Charlie Meyer, interim fire chief Greg Ruiz, and more. That’d be a whole other blog post! 3. Going hands-on with emergency responders. What about the fun stuff? Tempe Leadership gives you a taste of some of the city’s coolest jobs. I rode shotgun with a police officer on a busy Friday night, threw on firefighter gear and “rushed” up 60+ feet of stairs, and got behind-the-scenes tours of ASU, city government, and arts facilities. I even let a 100-pound German shepherd take a bite out of crime by chomping down on my arm. It was a scary sight even with a protective sleeve on. I sprained two ribs and landed in physical therapy for two months, but it was totally worth it! Don’t forget to check out 3 things I loved about Tempe Leadership’s second half. Wanna join Tempe Leadership? Let’s chat over coffee. Email me!